How long did you think you were going to get away with this column not being devoted to Jake Lamb in a given week? Regardless, as I listened to the hyperbolic Arizona sports radio throughout this week, Lamb represented a focal point. 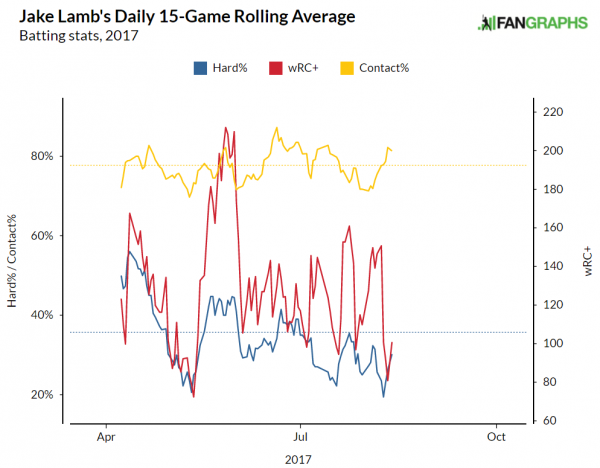 With the Diamondbacks hitting the strugglebus since just before the second half of the season began, Lamb was a target for the talking heads, despite this particular instance of discussion taking place a day after he went 3-for-4 against the Chicago Cubs. With that in mind, it’s probably important to note that there is nothing wrong with Jake Lamb. At least not now. A month ago, the narrative might have been different. Lamb struggled his way through the month of July. As such, the numbers from that month have really put a damper on his overall production for the second half of the season, despite a strong start through these first few weeks of the month of August. But despite those July struggles, Lamb seems to have regained his former. Nonetheless, that (apparent) abyss in which Lamb found himself last month, and his subsequent crawl out of it, is certainly worth discussing. By virtue of park-adjusted offense alone, July represented Lamb’s worth month of the season. His mark of 96 is the only time this season, at least to date, that Lamb has finished a month as a below average player, at least as painted by the statistic itself. The following represents where Lamb has stood this season, in regard to hard contact, overall contact rate, and wRC+, just as a general illustration of his performance over the course of the year. All three of those aspects took a dip in July. Despite the fact that he actually maintained a .351 on-base percentage and walked at a rate of about 20%, his lack of hard contact proved to be a tremendous hurdle that he wasn’t quite able to overcome in most respects. Although he still reached base, and did provide some power, he ultimately fell short over the month, as he hit only .178 for the month. What didn’t work in his favor at all was the fact that his batting average on balls in play also came in at .178. The good news there is that not only has Lamb seen a decrease in the amount of offspeed pitches at which he’s swinging, but also a slight increase in hacking at the hard stuff. Which is a recipe for driving that Hard% back up to where it needs to be. Oversimplified? Maybe, but this is likely too small a blip on the radar to be anything mechanical or health-related, like what last year’s second half struggles were attributed to. Lamb’s start in August should absolve him of any concerns over his performance. Despite overall second half figures that don’t look particularly favorable, his start in August has to provide a certain level of optimism, even for the perpetually pessimistic radio folks in the desert. The hard contact rate is back up to 43% across 51 plate appearances in the month, and everything else has come along with it. His average has risen from that .178 figure last month to a .289 mark across the month, while he’s reaching base at a .373 clip. His ISO has remained high, at .267, while the hard hit rate has helped his BABIP bounce back to a respectable .314 figure. Perhaps even more encouraging is the fact that Lamb’s strikeout rate is at just about 15%. Obviously there’s still time to go in the month, but he has yet to post a K rate under 20% in any given month this season. Even with the dip in production in July, Lamb remains an essential catalyst for this Arizona lineup. 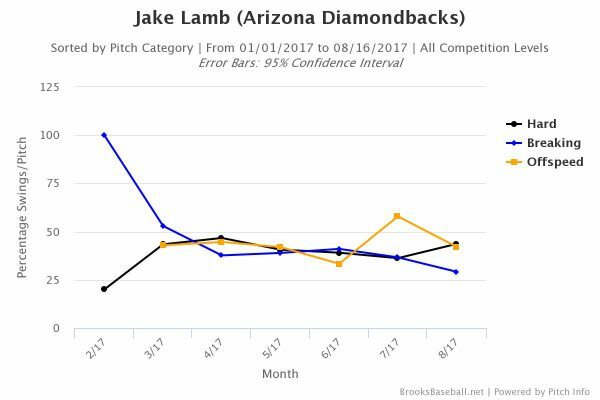 Ultimately, Jake Lamb’s July struggles are totally notwithstanding in the grand scheme of 2017. This is shaping up to be Lamb’s first season that features a complete body of work, and he continues to demonstrate that his rise in the first half of 2016 was no fluke. There were struggles last month that are impeding his numbers as a whole, sure. And there’s still the matter of his continued development against left-handed pitching. But whatever is being made of Lamb’s continued struggles are entirely misguided, as August has represented an entirely different outcome for the Arizona third sacker than July proved to display. We hoped you liked reading There’s Nothing Wrong With Jake Lamb by Randy Holt!